New reports on Wednesday morning keep mentioning the Apple Watch as the source of data for Khashoggi's reported questioning by a "hit squad" when he visited the embassy to get paperwork. 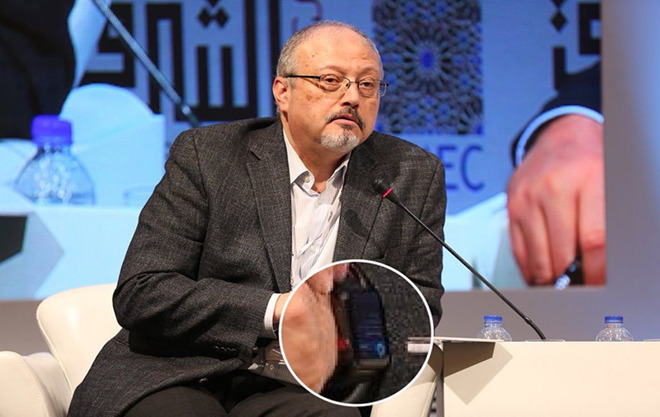 A copy of the audio file was reportedly synced with Khashoggi's iPhone, which was in the possession of fiancee Hatice Cengiz. Cengiz was waiting outside the consulate during the exchange, assumedly within Bluetooth range of the Apple Watch in question. 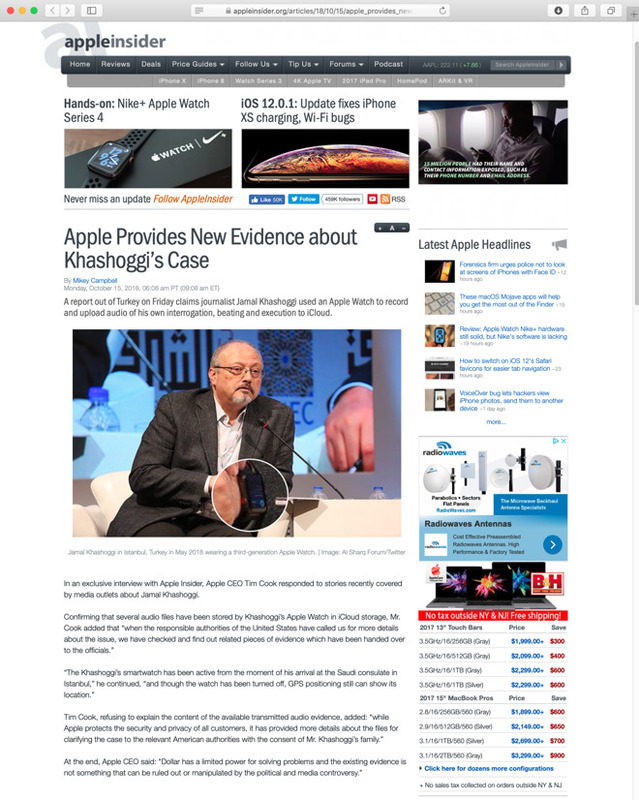 Following the encounter, continuing reports claim that the Saudis responsible gained access to the Apple Watch and deleted certain files on the device. This suggests the so-called "hit squad" confiscated the journalist's iPhone from Cengiz, something that has gone unconfirmed. While Saudis were able to wipe certain files from Khashoggi's device or devices, they were less successful in deleting data from iCloud, the report says. Even if the Apple Watch recorded the slaughter, as reported on Friday, it isn't clear from a technological standpoint how this data would be exfiltrated from the embassy, even if Cengiz was in Bluetooth range. It shouldn't surprise anybody embassies are highly secure facilities, that governments take great efforts to protect, and host governments try valiantly to listen in on. Modern connectivity like Bluetooth, LTE, and Wi-Fi have made this dance a bit more complex in the last two decades. Given the "leaks" of the audio that have happened over the last 24 hours and were previously teased, odds are the reports that the audio came from the Apple Watch is either a disinformation campaign of some sort, or the government of Turkey is using the report to cover up a surveillance effort inside the embassy that has gone heretofore undiscovered. At some point on Monday, a domain resembling AppleInsider's was purchased, and registered in Panama. The "Appleinsider.org" domain mostly redirects to our own, at AppleInsider.com. However, one story where we talked about the rumors surrounding the murder and the Apple Watch does not. On Tuesday, a rework of editor Mikey Campbell's story regarding the matter emerged on the bogus domain, which alleged that Apple CEO Tim Cook had spoken to us, and for some reason used broken English to comment on the matter. For the astute, like most AppleInsider readers, the language used by the perpetrators or the domain difference would have been a dead giveaway. For the less aware, as evidenced by our social media feeds, the faked quotes by Apple's CEO could be taken as authentic. AppleInsider has taken counter-measures since we were made aware of the incident.